For some time Tidal has held the crown when it comes to lossless streaming while Spotify's 'Premium' tier has lagged behind with streams that max out at 320 kbit/s. Now it seems that Spotify is preparing to launch a lossless streaming tier of its own. 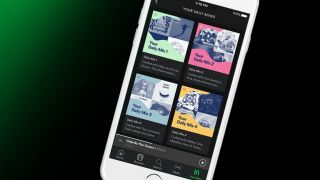 The Verge reports that users are being given the option of paying between $5 and $10 more than Spotify Premium, but when users are trying to actually sign up for the service they're being told that it's not available in their area. This suggests that the trial is merely to guage how willing people would be to pay extra for such functionality, and what price Spotify should charge for the service. Lossless audio is generally equal to CD-quality, which is a resolution of 16-bit/44.1kHz, and contrary to some reports doesn't require a pair of Lightning connector-equipped headphones - a standard 3.5mm jack is just fine. Although Tidal was the first streaming service to allow users to stream lossless audio (without tying it to a specific piece of hardware), the service has since moved ahead to offer high-resolution music streams using its MQA technology. For the time being at least it appears as though Tidal might retain the audiophile edge, but the new development shows that Spotify is making a serious effort to catch up.